This rhythm is also called “Djelidon” and “Djelifoli” which literally mean “djeli’s dance” and “djeli’s rhythm” respectively. Sanja and Lamban are all names for the Mali dance or rhythm that were danced exclusively by the Djeli. This was accompanied only by a balafon or kora. However, Djembe and Dunduns are accompanied now. In Mali, only two dunduns are used: the Kenkeni and the Dundun. This sangban pattern introduced here is added by Malinke. Djeli (Griot) is a West African poet, praise singer, and wandering musician, considered a repository of oral tradition. 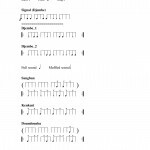 This song is often sung with this rhythm. Ye, jaliyaa, Allah l’e ka jaliyaa da. Yes, djeli, it was God who created djeli.